The forex markets are rather mixed and quiet today. Trading has also become a bit subdued as US is on Martin Luther King day holiday. But UK Prime Minister Theresa May’s Brexit plan B might still trigger some volatility. For now, New Zealand Dollar remains the weakest one for the day. It’s followed by Canadian Dollar and Australian Dollar. Yen is the strongest one, followed by Euro and then Dollar. But there is actually no apparent sign of risk aversion. The markets are just mixed. Technically, USD/CHF finally broke 0.9963 resistance, which should indicate completion of correction from 1.0128 at 0.9716, further rise is in favor to retest 1.0128. EUR/CHF is pressing 1.1340/8 resistance zone too. Break will bring further rally. Dollar is apparently trying to strength elsewhere too. But EUR/USD has to break 1.1353 minor support first. 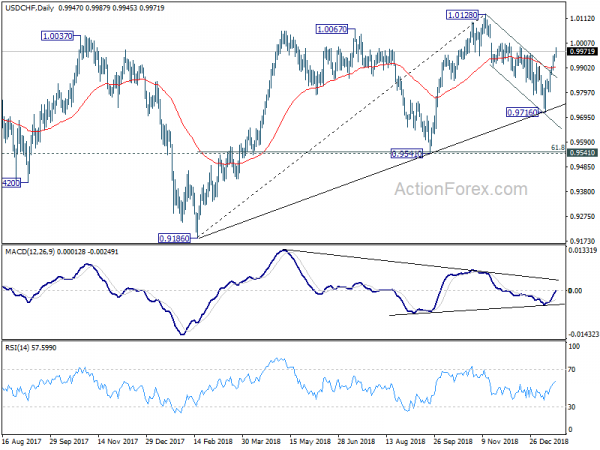 Also, AUD/USD needs to break 0.7116 minor support and USD/CAD needs to break 1.3323 minor resistance to proved underlying Dollar strength. In other markets, FTSE is currently down -0.07%, DAX is down -0.60%, CAC is down -0.29%. German 10 year yield is down -0.0012 at 0.262. Earlier in Asia, Nikkei rose 0.26%, Hong Kong HSI rose 0.39%, China Shanghai SSE rose 0.56%, Singapore Strait Times dropped -0.12%. Japan 10-year JGB yield dropped -0.0099 to 0.004, staying positive. Today’s focus is on UK Prime Minister Theresa May’s Brexit plan B. She’s due to make a statement in the parliament at 1530 GMT. Her spokesman said the Brexit will have to be changed if it’s to be approved by lawmakers. And there were talks going on to understand what exact changes are needed. Daily Pivots: (S1) 0.9938; (P) 0.9949; (R1) 0.9967; More…. 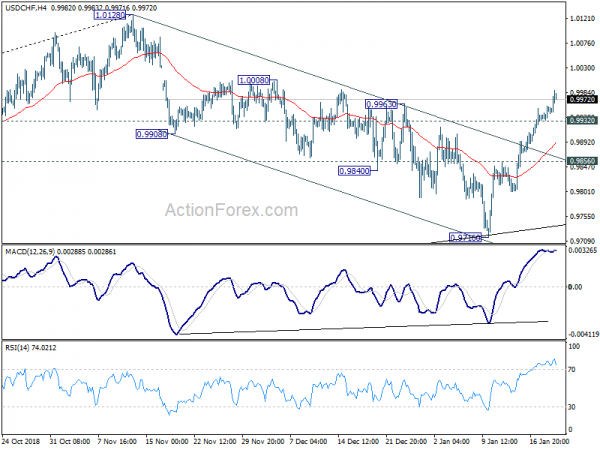 USD/CHF’s rally continues today and break of 0.9963 resistance should confirm the bullish case. That is, corrective fall from 1.0128 has completed at 0.9716 already. Intraday bias is back on the upside for retesting 1.0128 next. On the downside, below 0.9932 minor support will turn intraday bias neutral again. But near term outlook will remain cautiously bullish as long as 0.9856 minor support holds. In the bigger picture, current development suggests that rise from 0.9186 has possibly completed with three waves up to 1.0128 already. Decline from 1.0128 could either be correcting this move, or reversing the trend. As long as 0.9541 support holds, we’d slightly favor the former scenario, and expect another rise through 1.0128 at a later stage. However, sustained break of 0.9541 will confirm trend reversal and bring deeper fall back to 0.9186 low.